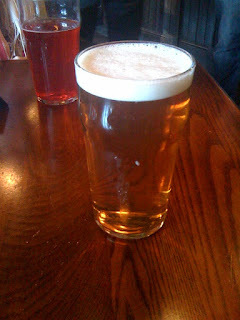 Thornbridge Jaipur is a beer that I've had many times. It's a beer that introduced me to hops and it's something I'd count amongst my staple drinks. As my passion and thirst for new great beer develops, it's easy to forget those I once loved. When faced with the choice between something new and something I know well; it's often difficult to pick the known over the unknown. On Easter Sunday I stopped by the Old Thameside Inn for a pint. Choices on hand pull included a couple of Adnams beers, a Green King offering and Jaipur. I asked for a Jaipur and was given the single best pint of it I've ever had. So good in fact that I felt an obligation to write this rambling blog entry about it. Have a look at the photo to the right. How good does that look! The head was big and white and fluffy. The body was flecked with a light sprtizy carbonation. Citrusy hops fought to jump out of the glass and smash their way to my nose. On drinking I got punchy citrus, exotic fruits and then a crisp bitterness that built just to the point of becoming too much before fading away. I wrote a post a week or so ago about Cask Ale Week. Part of me wishes I'd had this pint before writing that. Not only the best pint of Jaipur I think I've ever had, also the best pint of Cask Ale I've had for quite some time. On Easter Sunday I fell back in love with Jaipur, next time you go to pick something new over an old favourite ... maybe give it a second thought. Looks bloody lovely that pint, making me thirsty! Is is breakfast beer time yet?? I had to be persuaded that it wasn't sparkled! Bloody glorious. Cotton wool head and bright as button. Bad news, I think you've missed the boat on breakfast. Good news though ... we're entering lunch territory! Been too long since I last had Jaipur. Yum. If there's any one beer that can make a Reluctant Scooper of you, it has to be Jaipur. It's almost the season for me to start buying nine-pint minicasks of Jaipur and trying not to drink them in one session. Sounds perfect to take to a summer BBQ!